Hippie clothes. Bohemian clothing. Artsy clothing for expressive people! 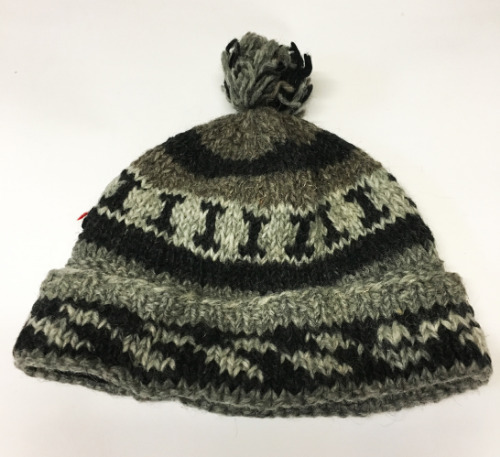 This is a traditional knit roll hat handmade by artisans in Nepal. It is made of a 100% WOOL, ultra soft and warm with a fleece lining for extra warmth and comfort. A variety of ethnic designs. This hat is so charming with its handmade look and cozy feel. You will wish you knit it yourself! These hats are made of recycled materials and as such there might be discolorations or irregularities to the weave common of recycled fabrics. The patterns you receive may vary from the picture. The hat in the picture is not the exact item you will receive. These hats are available in assorted colors and patterns. We choose for you! There is some stretch to this hat but the measurements are taken unstretched. Check the measurements below.